Facial toners, not to be confused with similar astringents, remove residue left from facial cleansers and temporarily minimize the appearance of pores, as noted in "Milady's Standard Cosmetology." Toners, unlike other astringents, also typically contain a hydrating or calming ingredient to keep facial irritation to a minimum. Applied to the face before moisturizing and after cleansing, toners are part of an ideal daily beauty routine. The ingredients in toners vary by manufacturer, but all serve the same general purpose. Facial toners contain astringent ingredients. Isopropyl alcohol is found among the ingredients listed in many over-the-counter toners, according to "A Consumer's Dictionary of Cosmetic Ingredients." Alcohol-based toners remove soap residue and bacteria, and provide a tingling or cooling sensation as the alcohol evaporates. Alcohol-free formulas make use of natural astringents such as witch hazel or tea tree oil, indicates "Milady's Dictionary of Skin Care and Cosmetic Ingredients." Toners meant to soothe and rehydrate dry, chapped skin contain ingredients that work toward this purpose. Aloe vera, vitamin E and chamomile extract all work to soothe the skin and provide a small amount of moisture in the process, according to "The Complete Beauty Bible." While the nourishing and hydrating ingredients in facial toners are not meant to replace those in a separate moisturizer, they can allay some of the effects of harsh facial cleansers, particularly in individuals with sensitive or acne-prone skin. Preservatives, such as parabens. citric acid and potassium sorbate, keep potentially harmful microorganisms from growing in the facial toner and spoiling the formula. Emulsifiers are present to keep oil- and water-based ingredients from separating over time. Polysorbate-20 and hydrogenated castor oil both work as emulsifiers and are found in many toners, states "Cosmetics Unmasked." Essential oils can be included in facial toners for their purported therapeutic benefits or to provide fragrance. Lavender essential oil has a light, floral fragrance that many find soothing. It is also a reputed antimicrobial ingredient. Chamomile and marigold extracts soothe skin and provide mild lightening effects, as noted in "The Herbal Companion," two qualities that prove beneficial for acne and blackhead sufferers. 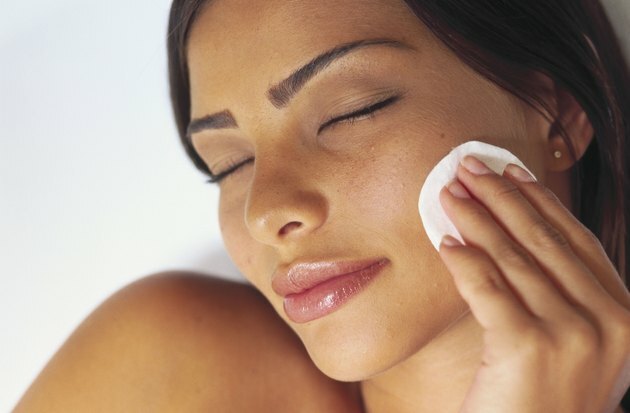 Toners typically do not include rosemary or sage essential oils, which can darken already blemished areas of the skin. Artificial fragrance can also be present among the ingredients of a facial toner -- the vague term "fragrance" can indicate up to 4,000 separate chemicals, cautions "Cosmetics Unmasked."